Am I Allergic to Goldenrod? 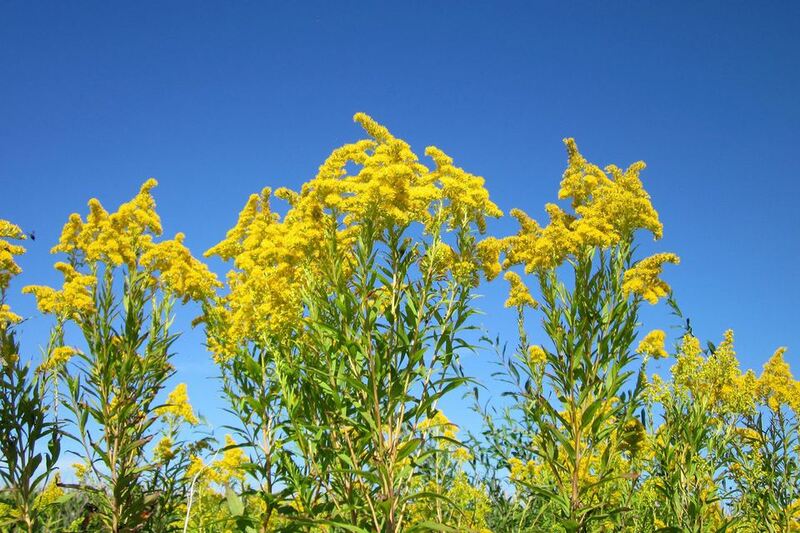 Many people experience allergies in the late summer and fall, and they may blame the goldenrod that they see blooming everywhere at this time of year. However, goldenrod (Solidago) is probably not what is making your allergies become a nuisance during the late summer. The plant that probably is lives nearby, however. Goldenrod is the Earth's way of saying that fall is on the way. The golden flowers brighten the fields and ditches that are mostly filled with greenstuff during this time, having bloomed long before. As the goldenrod comes into bloom, the pollinators have a burst of activity and are busily gathering their last big harvest of food, before the cold of fall takes hold. Susun Weed reminds us that that nectar is proof that goldenrod isn't the problem. In order for your pollen allergy to act up, pollen has to be windblown and no insects are needed. Many people who suffer from allergies, dislike this time of year. They point out that their allergies seem to bloom right along with all the gorgeous goldenrod. The real culprit is probably growing alongside the goldenrod, although much less showy. Ragweed grows in the same areas that goldenrod does, and blooms at the same time. The difference is, goldenrod has the pretty flowers that draw the eye, while ragweed has a small, green bloom, that is hard to see, especially while traveling down the road in a vehicle. According to Peterson Field Guide: Western Medicinal Plants and Herbs, Pollen from the genus Ambrosia(Ragweed), is responsible for approximately 90 percent of pollen-induced allergies in the US. Of course, anyone can have an allergy to anything, so nasal allergies may not be bothered, but if you touch goldenrod and find that your skin becomes inflamed, you could have a contact allergy to it. Goldenrod is very important for your herbal medicine chest. It has nutritive and medicinal qualities that can't be beaten. Considering its abundance in most locations all over North America, it makes a good herb to start your family herbal kit. What Do I Do With Goldenrod? To harvest, snip the blooms (remember to harvest responsibly-even with an abundant herb such as this)and dry some by laying out in a cool, dry place. You can also place in a dehydrator, with just the fan on to circulate the air. Use some more of the sweet smelling blooms to fill a glass container. Cover with apple cider vinegar and use it as a tonic to fight colds and flu, and help boost the immune system in general-always a good thing during the winter months. Make a tea for that achy, tired feeling you get when sick as well. You may want to add a touch of chamomile and a bit of honey, although it doesn't need the addition to be palatable. Goldenrod is a sweet, light flavor that all ages seem to enjoy. Goldenrod can also be used as a gentle home remedy for skin eruptions and rashes. Make an infusion and allow it to cool, before straining and keeping in the refrigerator for up to 2 days. Since it is a gentle herb, this is fantastic for animals and children. If you are using it on a dog or cat, as a hot spot soothing remedy, they can safely ingest it. Finally, goldenrod has been historically used as a tea for relieving urinary tract infections. Motherwort: What is It Good For?